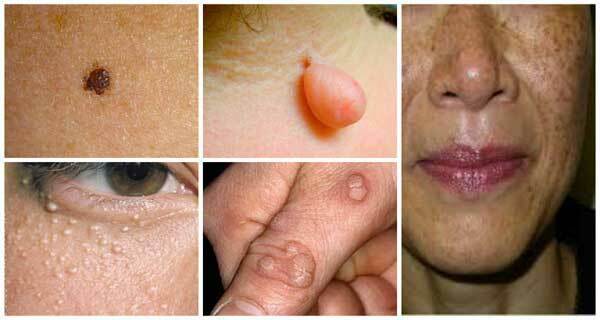 These are the 9 most effective natural ways to get rid of moles! In most cases, moles can cause no harm and represent only a cosmetic issue, but almost all people find it really unattractive and would like to get rid of it. Moles, or medically known as melanocytic nevi, are spots on the skin in brown, black, or skin color, and are created as a result of the collection of melanocytes. Namely, melanocytes are the cells responsible for the production of pigment, the coloring substance known as melanin. Moles may be smooth or rough, raised a bit, or flat, with or without hair, and usually, appear by the age of 20 or 30. Their appearance, as well s their number, may be influenced by several factors, like sun exposure, genetics, or hormonal fluctuations. Over time, some of the moles may face and eventually vanish, but not all of them. Therefore, we will reveal the most effective methods to naturally solve this issue. However, it is of great importance that you inspect the mole for any abnormalities in color, diameter, or symmetry of the border before you start using some of these home remedies. If the mole has been changed somehow, you should consult your dermatologist and make sure it is not cancerous. You should never try to treat cancerous moles on your own. This beneficial oil will aid in the elimination of moles, warts and skin tags as it acts as a discutient. Therefore, it will dissolve and remove these unusual growths, and will not leave scars. Yet, note that you need to be patient, as this method required more time, since it eliminates moles gradually, in layers. You need to add a pinch of baking soda to several drops of castor oil and add a ground aspirin to the mixture. Then, rub it on the mole and leave it for several hours in order to dry. Repeat the procedure twice a day for a month. You can also avoid baking soda and use only castor oil. Aloe Vera is also an effective natural remedy in the process of removing or lightening of moles. You should apply some fresh aloe Vera gel on the mole. Then, secure it with a cotton bandage, and leave it thus for 3-4 hours in order to provide enough time for the absorption of the gel. For a month, you should repeat this procedure twice or three times daily. It is one of the best natural remedies in the case of moles, as it includes enzymes that break down the clusters of the cells that produce pigment. Also, it successfully lightens the dark pigmentation. You should get a fresh garlic clove, crush it, and place a piece on the mole. Next, secure it with a bandage and leave it thus to act for several hours, or during the night. Repeat this on a daily basis for several days, and you will notice the mole fall off naturally afterwards. In most cases, this happens after the fifth day of application. Yet, note that garlic may cause redness or irritate the skin when applied. Onion juice has strong acidic properties, so it can effectively remove moles and enhance the skin tone. Using a cotton swab, apply some onion juice on the mole, and leave it to act for half an hour. Then, rinse and repeat 2-3 times daily for three weeks. You can also mix apple cider vinegar and onion juice in equal amounts, apply the mixture on the affected area, and leave it to act for 30 minutes. Repeat on a daily basis for at least 4 weeks. Raised moles can be effectively eliminated with the use of flaxseed oil, as it softens and loosens them on the edges, and they are afterwards easily removed. You should mix some flaxseed oil, honey, and finely ground flax seeds in order to prepare a paste, and apply it on the moles. Leave the paste to act for 1 hour. Repeat this procedure 3 times a day for several weeks. Grapefruit seed extracts are high in flavonoids and vitamin E, so it efficiently removes moles and other skin issues. You should apply a drop of the extract on the affected area and secure it with gauze or a bandage. Leave it to act for several hours, and repeat the method 2-3 times during the day, for a month. Moreover, the grapefruit seed extract can also be mixed with avocado oil, in a 1:10 ration. Apply the mixture on the moles and allow it to act for 15 minutes. Repeat on a daily basis until your moles are completely gone. Apple cider vinegar is an extremely popular and effective natural remedy. It successfully removes moles due to the acid content, since it scabs them and helps to easily fall off. Therefore, you should apply a cotton ball soaked in an apple cider vinegar on the affected area, secure it with a bandage and leave it until the next morning. Repeat this every day for around 10 days. Furthermore, you can lightly scrape the surface of the mole with an emery board or rub some warm water on it and afterward apply vinegar until it becomes white. You should leave the vinegar to dry off naturally on the mole. Repeat this a few times during the day. Yet, note that apple cider vinegar may worsen the mole at the beginning, but after a few days, it will successfully treat it and eventually eliminate it, and it most cases, it won’t leave a scar. However, in the opposite case, you should use coconut oil to treat scars. Naturally astringent, this essential oil will effectively dry the mole up and remove it gradually, one layer at a time. You should combine it with olive oil, in 1:8 ratio. Then, apply the combination on the affected are and leave it to act for several hours. Repeat 2-3 times daily, for several weeks. In order to prevent scars, it is advisable that you continue the treatment a few days after the mole has been removed. However, if this treatment irritates your skin, you should not do it. The fresh juice of pineapple will help you make moles less visible, by lightening them. You should apply a cotton ball soaked in pineapple juice on the mole and leave it until the next morning. Repeat this treatment a few times during the day, for several weeks, or until you obtain desirable effects. For best results, you should every day use a freshly squeezed juice, as thus, it will include more citric acid. Moreover, apart from pineapple juice, you can also use other acidic juices, including the juices of sour apples, lemons and grapefruits. Nevertheless, before you start a treatment with some of these natural remedies, especially with apple cider vinegar or garlic, you must check whether your skin is not sensitive to them, in order to prevent other issues. Moreover, if a treatment with some of these natural remedies aggravates the condition, you should immediately stop using it.